Music is an integral part of my novel Song of Simon. Originally, Simon was supposed to be a rocker type, but I felt that was too cliché. Instead, I put him in the “small quiet places” of music. I wanted him to be an outsider, so he listens to stuff none of his classmates could relate to. He likes folk, he likes acoustic blues, he likes old murder ballads that no one remembers. You know that he loves Arlo Guthrie. There was a reference to “Alice’s Restaurant” in an early draft. There’re a few Woody Guthrie references in the book too, if you know where to look. A lot of Simon’s interests were painted by my time as a music journalist. I wrote this article many years ago for http://www.suite101.com. I hope that you enjoy it. How does he keep the napkin on? 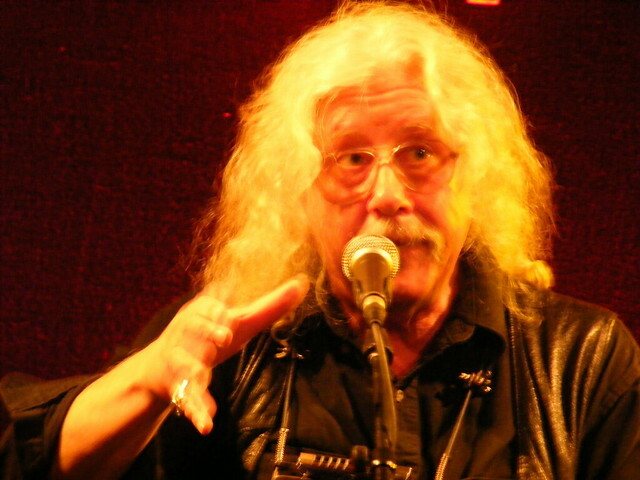 The Arlo Guthrie song “Alice’s Restaurant Massacree” tells what appears to be an impossible story about the stupidity of authority. Yet, the absurdity of the lyrics in “Alice’s Restaurant” are for the most part, true. Alice, Officer Obie, and even Judge Hannon, were all real people, and the heinous crime of littering actually took place that fateful November Day. In November of 1965, Arlo and his friend Rick Robbins drove to Great Barrington, Massachusetts to have Thanksgiving dinner with their friends Alice and Ray Brock. The Brocks were both teachers at the nearby Stockbridge School of Stockbridge, Mass, where Arlo was a recent graduate. The couple lived in a deconsecrated church, and often had young people and itinerants staying with them. Alice owned a small luncheonette nearby, about half a mile from the railroad track. This restaurant would soon be immortalized by the song’s chorus, even though it plays no role in the song’s events. Once at their house, Arlo and Rick helped the Brocks clean the church of all the garbage that had piled up and take the trash to the dump. When they reached the garbage dump, they found it closed, so they left the trash down a hill nearby. Not long after, the pair were arrested by Stockbridge officer William J. Obanhein, soon to be immortalized as Officer Obie. Incidentally, Officer Obie would later go on to become the Stockbridge Chief of Police. Officer Obie later admitted that he had no sympathy for the kids and the other hippies that had been coming into Stockbridge, and decided to give Guthrie and Robbins a scare. Obanhein threw the kids into a jail cell until Alice Brock posted bail. Two days later, Arlo and Rick pled guilty to littering to Judge James Hannon. As spoken of in “Alice’s Restaurant,” Judge Hannon was blind and could not see the photo evidence the Stockbridge police had so diligently taken. The pair were fined $25 each and ordered to clean up the trash. It is the other part of the song Brock alludes to, where Arlo is called before the Draft Board, that made “Alice’s Restaurant” an anti-war classic. Arlo has to stand in front of the Draft Board, only to be saved from the draft by his conviction for littering. The irony of this, along with the song’s punch line (“you want to know if I’m moral enough join the army, burn women, kids, houses and villages after bein’ a litterbug”) galvanized the hippie anti-war movement. As mentioned above, “Alice’s Restaurant” is a (mostly) true story. The people involved were real, and both the church where the Alice and Ray Brock and the lunch counter that Alice ran still exist. Alice’s Restaurant was formally named “The Back Room Rest” and was located behind a grocery store in Stockbridge, at 40 Main St (US-7). The place is currently known as Theresa’s Stockbridge Café. Love it, all those outspoken creative caring hippees. Wonderful story. Alices Restaurant. Thank you too.